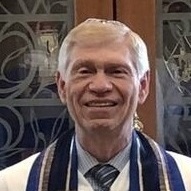 Temple Sinai's Rabbi since 1993. Rabbi Stuart W. Gershon is now in his 25th year as the Rabbi of Temple Sinai. Rabbi Gershon was ordained by the Hebrew Union College-Jewish Institute of Religion (HUC-JIR) in 1989. Rabbi Gershon possesses two M.A. degrees, one in Jewish Education from The Jewish Theological Seminary of America and the other in Hebrew Literature from HUC-JIR. He received his B.A. in Judaic Studies from the University of Pennsylvania. Rabbi Gershon is known for his warmth, caring, and sense of humor. He brings his own unique blend of spirituality and intellectuality to Shabbat and festival services and to Torah study. "Rabbi, you are wise yet approachable, silly yet responsible, funny yet respectful...You are a tzaddik, a righteous one. You are the most purely good person I have ever known, and your faith is clearly part of the reason why. That is why I kept coming back to services. That's why I kept attending Hebrew High School. Before I was even a Jew in my own right, I knew that if Reform Judaism could produce a man like you, then it was a religion worth believing in." Rabbi Gershon was a founder and tri-chair of the Darfur Genocide Rescue Committee of Summit from 2007 to 2009. He also served as a founder and co-chair of the New Providence Diversity Committee from 2007 to 2010. Rabbi Gershon was awarded the "Keeper of the Dream" Award by the Martin Luther King Day of Service Committee in 2010. Rabbi Gershon is the author of Kol Nidrei: Its Origin, Development, and Significance. Rabbi Gershon began his rabbinic career in 1989 as Assistant Rabbi at Temple Emanuel in Worcester, Massachusetts. He was promoted to Associate Rabbi in 1992. In Worcester, Rabbi Gershon served as the chairperson of the Jewish Education Committee of the Worcester Jewish Federation from 1991-1994. In 1993, Rabbi Gershon co-founded and organized the very first "Torathon," a synagogue-wide community educational event. Rabbi Gershon was designated "Rabbinic Award Winner" by the Council of Jewish Federations in 1993 in honor of his volunteer leadership for Worcester Jewish Federation. Cantor Marina Shemesh joined Temple Sinai in July 2012. She received her investiture as Hazzan and Master of Sacred Music from the Jewish Theological Seminary of America in May 2004. She previously served as cantor at Congregation Mevakshe Derekh in Scarsdale, NY, Congregation Beth Israel in Worcester, MA and Brotherhood Synagogue in NYC. Cantor Shemesh feels fortunate to have found her calling in the vast and beautiful world of Jewish music and loves to share this passion with congregants of all ages, connecting them to our rich spiritual tradition, and liturgical and cultural heritage. Her work in opera has taken her to major roles with companies including New Israeli Opera, Canadian Opera Company, Vancouver Opera Company, and Israel Vocal Arts Institute in Tel Aviv. In addition to her opera work, Cantor Shemesh performed in concerts, recitals, and oratorio with major Israeli orchestras, such as the Rishon-le-Zion, Ashdod, Raanana, and Haifa Technion orchestras. Cantor Shemesh has received many impressive musical awards and prizes from vocal competitions in Montreal, Bilbao, Athens, and Tel-Aviv. She has been the recipient of many scholarships and awards, such as: America Israel Cultural Foundation, Israel Vocal Arts Institute Foundation (IVAI), Jewish Foundation for Education of Women, and others. Marina taught vocal performance at Clark University in Worcester and currently she teaches voice at her voice studio in Livingston and at the H. L. Miller Cantorial School at JTS. In addition to Jewish Theological Seminary, she holds a Master's degree in Music and Voice Performance from St. Petersburg State Conservatory and Rubin Academy of Music in Tel-Aviv, where she won first prize in the Academy's Vocal Competition. Cantor Shemesh responsibilities as a Cantor of Temple Sinai include preparing our students for Bar/Bat Mitzvah, and leading services for Shabbat, the High Holy Days, and the Festivals. She also teaches Cantillation and prayers at the Religious school, Confirmation at the High School as well as leads Shabbat celebrations at the Early Childhood Education Program. She conducts Shir Libeinu Choir and the Temple Sinai Band. Cantor Shemesh directs the Purim Spiels productions and produces annual benefit concert in series “Cantor Shemesh and Friends”. As a member of the clergy team, Cantor Shemesh attends to the pastoral and life cycle needs of our congregants. Cantor Marina Shemesh is a member of Cantors Assembly and the American Conference of Cantors. She lives in Livingston, NJ with her husband and her two sons Daniel and Elijah. Here are some musical selections Cantor Shemesh would like to share with you.